I have frequently utilized Photoshop's soft-proofing when making prints. While I have found it useful for getting a general idea of how the print might look, I have also found that the prints would come out with more contrast and with colors appearing far less out of gamut than soft-proofing might suggest. This despite having a monitor that is fully calibrated. Just recently, I saw an article that extolls the process of making hard copy 'soft-proofs' and thought it might be interesting to folks who read this blog. It is called "The Hard Truth About Soft Proofs" and was written by West Coast Imaging. I am strongly considering undertaking a large photography project. I have completed small projects before, but not large ones. I started considering the issues that would need to be sorted through when approacing such a project. Not the issues involved with deciding upon a subject or actually photographing the project, but in the output. More specifically, what should the project look like. It turns out that it can actually take some time and experimentation to consider the possibilities and come to some conclusions. If the project is to contain many images, and if the project is going to end up as prints, there needs to be some sense of consistency and coherence to the images. 1) Color or Black & White (or both)? This one seems pretty obvious, but it is a major fork in the decision tree that will define the appearance of the project, where it will potentially be exhibited or published, and, to some extend, who the audience is. 2) If the project is to be printed in Black & White, should it be toned....and, if so, warm, cool, sepia etc? 3) In the case of Epson, if printing in black and white, should the prints be made using the straight printer driver or using the ABW driver. This will, of course, determine how the toning is done. 4) What paper should the images be printed on? Matte, semi-gloss, glossy, warm toned, bright white, etc? 5) Should you happen to have more than one available profile for the paper, which one should be used? 6) Are there other multi-media options that might enhance the project, such as video or audio accompaniments? Here is another issue I have been thinking about. Help. As in another set of eyes. Sometimes one can become so emotionally involved in a project that it can become all to easy to lose perspective and objectivity. I definitely think it is worthwhile to have a photographer friend who is willing to help with unabashedly objective feedback. What you don't need is someone to tell you that everything is perfect. These are a few of the things that have run across my mind. Any other thoughts? Over the last year or two, I have watched as various new papers have come out for black and white inkjet printing. I have really wanted to venture into black and white, but just never really liked the appearance on matte paper, though I do love the appearance of color prints on matte watercolor paper. In theory, I could change my 7600 printer over to photo black ink to use the new highly touted Baryta papers for black and white printing, but it is quite expensive as well as being a hassle to change over. I decided to make the jump and ordered a 7900! I had been thinking about it for a while and, frankly, was not really ready to buy just yet. However, Epson has a $500 cash rebate on the machine if purchased before 3/31, so it didn't make sense to wait. I purchased it from Shades Of Paper, which is where I purchase all my media and ink and have been extremely impressed with their prices, superb and personal customer service, and rapid shipping. It should also be noted that the price listed on any of the printer vendor's websites (including Shades Of Paper) is not the real price. It is similar to buying a car. You have to get on the phone and talk to someone to get the real price. Sometimes you have to call more than once. Truth be told, when you include the $500 rebate, the final phone price, and the fact that the 7900 stand is included in the price of the printer I actually got the 7900 for less than I purchased my 7600 plus stand for back in 2004. So, I am looking forward to experimenting with black and white printing as well as luster/semi-gloss color printing all with a wider color gamut, smaller droplets, improved dithering and at a faster speed. It had been my experience from back when I was printing with an Epson 870 that prints on luster papers matched the soft-proofing in Photoshop much better than matte papers did, and others have reported this as well. I am hoping that there might even be some time savings due to less required 'tweaking' of images with these papers. This is also quite important to me as I tend to be an incessant 'tweaker'. The printer won't arrive until late next week and I plan on making some diary type posts about the machine, my impressions, and any problems that might occur. I can say right now that my first problem is going to be getting home for the delivery truck and hoping that I can get the delivery folks to take the machine through the front door of my home. 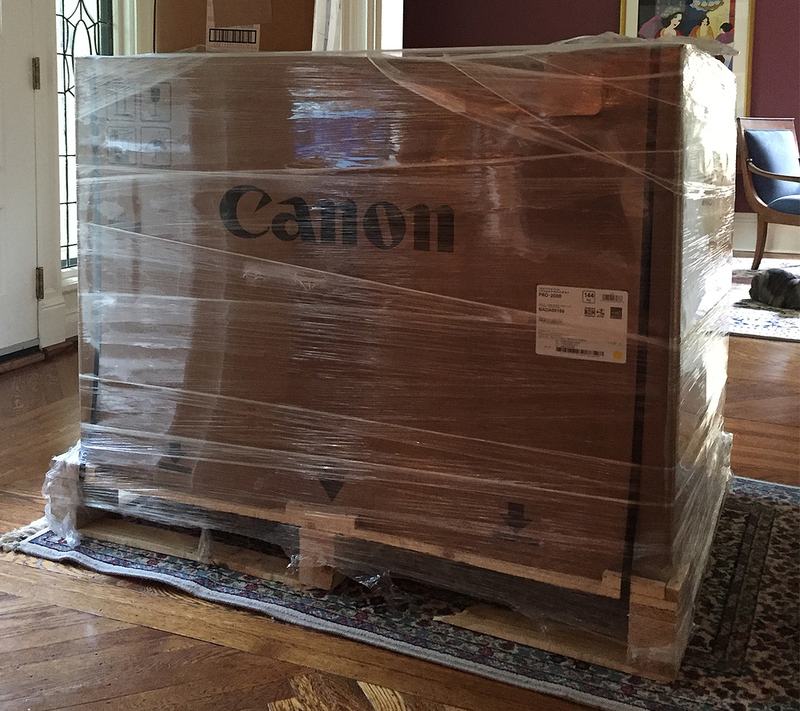 My understanding is that with the packaging it weighs over 300 pounds. Then I have to try to get it up a narrow winding staircase. It can be carried up unpacked and off the stand, but it is still quite large, long, and heavy. Even in this 'naked' state I believe it weighs over 150 pounds. I managed, with some help, to get my 7600 up the staircase and this is just a bit bigger in dimension, so I am hoping it makes its way up 'with a little help from my friends' in an intact state as well.